The marginated tortoise (Testudo marginata) is found in Greece, Italy and the Balkans in southern Europe. It is the largest European tortoise, reaching a weight of up to 11 lb and a length of 14 inches typically. The posterior end of the shell has a saw-like formation, flanged outward like a bell. 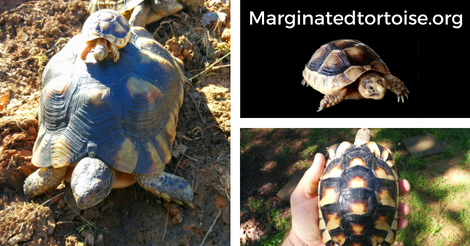 The marginated tortoise is herbivorous, can hibernate for the winter and is typically a good starter tortoise due to it's medium size and vegeterian diet. Through this website I hope to share how I have successfully been keeping these great animals. There are many ways of keeping tortoises and we are always learning new techniques so please don't think that these practices are the only way, but just ways that I have been successful.